Now ranked 59th in the world and set to play alongside world No 1 Leona Maguire in the Vagliano Trophy at Malone this week thanks to wins in the Irish Girls, Scottish Ladies and Welsh Ladies Strokeplay championships already this year, powerful Royal County Down Ladies’ star Mehaffey simply ran out of steam and was crushed 6 and 5 by the slight but clinical Sligo girl in the decider. A former girls international brought up on the pitch and putt course run by her parents, a mile from the first tee at Enniscrone, Helly gave herself a 23rd birthday present to remember forever with huge in over one of Europe’s most in-form players. “I knew I was the underdog but I had nothing to lose and I was playing very well,” said Helly, who know looks certain to win her first senior cap in September’s Home Internationals at Royal Wimbledon. With one semester to complete at Marshall University in West Virginia before graduating with a degree in Sports Management, Helly beat another birthday girl in 17-year old title holder Mary Doyle from The Heath 2 and 1 in her semi-final as Mehaffey saw off Howth’s Laura Doherty by the same score in the other. It promised to be a cracking final in golden sunshine on stunning Sheephaven Bay, but the tension and fatigue took their toll and there were more bogeys than that pars before Helly made a two-putt birdie four at the sixth to go one up. Mehaffey was clearly out of sorts and Helly pounced, winning the eighth and ninth in pars to turn three up before claiming the 10th against the head with a 30 foot birdie putt. Five up with six to go, Helly did not allow herself to think about the score line and fired a superb pitch to three feet at the 322-yard 13th to set up a title winning chances. “I kept telling myself match is still all square,” she said. “I didn’t know I had that putt to win until my caddie reminded me, but I tried not to think about it and made a good stroke and got it in the hole. Having shed a few tears that her parents couldn’t make it, she said later: “They would have given anything to be here. Mum had a check up in Dublin and dad was in Galway for a minor operation. Sarah Helly (Enniscrone) beat Mary Doyle (The Heath) 2 and 1. Sarah Helly beat Olivia Mehaffey 6 and 5. 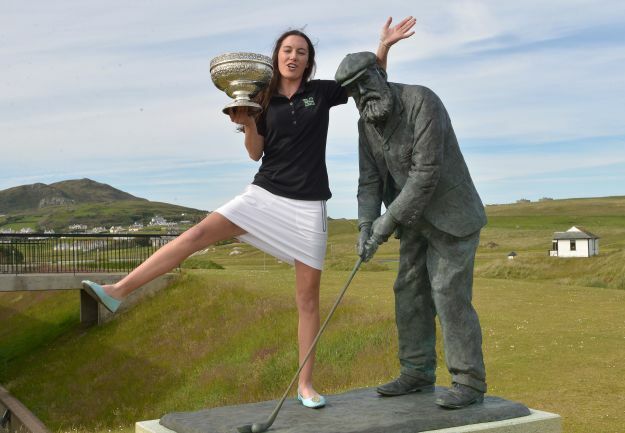 Olivia Mehaffey will be bidding to go at least one better than last year when she faces Holywood's Jessica Carty in the semi-finals of the Irish Women's Amateur Close Championship at Enniscrone on Tuesday.